Perfect for: A post workout pick-me-up! Add your almond milk to your blender first, before adding the rest of the ingredients. Blend on high until a nice thick consistency. Top with pistachios for healthy fats, desiccated coconut for sweetness and fresh blueberries for delicious crunch! 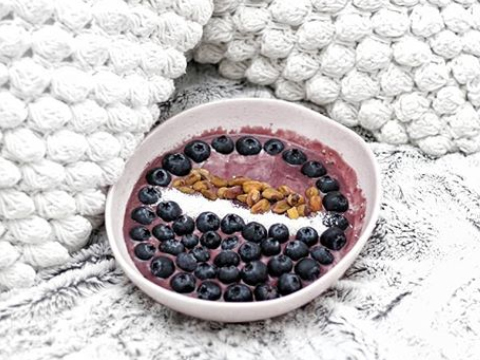 Step Aside Açaí, It's The Blueberry's Time To Shine! With over 17,000 tonnes of blueberries grown in Australia each year, it's time to get blending! If you're looking to kickstart the morning with a hit of antioxidants and protein, then this bowl is perfect. The high levels of potassium, vitamin C and antioxidants in the blueberries will work on your skin and eyes, whilst the protein works on your muscles. A powerful combo! Thanks to @foodfitnessfashion_fff.